DUAL DYNAMO, REVOLUTIONARY RECHARGEABLE! 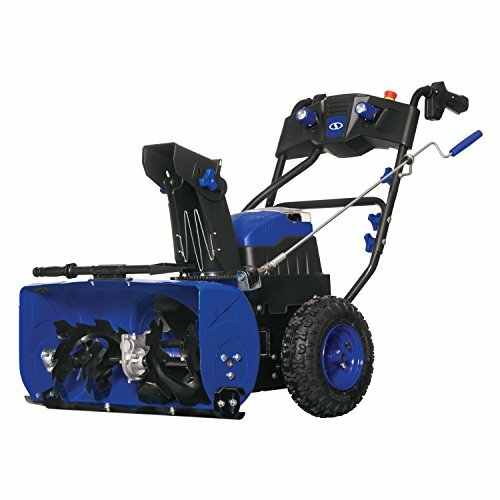 Just a few short years ago, Snow Joe took the world by storm with its innovative line of battery-powered snow blowers. Now were back in a BIG way again with the best-in-class iON24SB-XR. Ideal for clearing snow from sidewalks, large driveways and walkways, the Snow Joe iON24SB-XR is the revolutionary new addition to the Snow Joe iON arsenal and the worlds first dual-stage snow blower to provide easy and convenient GAS-FREE and CORD-FREE operation. Powered by EcoSharp technology, Snow Joes innovative, interchangeable rechargeable lithium-ion battery system, the iON24SB-XR includes two 40 V 5.0 Ah batteries to deliver up to 40 minutes* of whisper-quiet runtime with zero carbon emissions for cleaner air. This state-of-the-art cordless dynamo is also engineered with a powerful 2500 W brushless motor. The iON24SB-XR starts instantly with a simple push of a button, and an integrated push-button display puts the power of the iON 2-stage at your fingertips for unparalleled snow-shredding performance. Equipped with a heavy-duty serrated steel auger and powerful impeller, the iON 2-stage plows through up to 1000 pounds of snow per minute, clearing a path 24-inches wide by 13-inches deep with each pass. Plus, the scraper bar at the base of the unit lets you clear right to the ground without damaging your deck or pavement. Featuring a 180 adjustable chute, the iON 2-stage lets you direct the snow stream, up to 32 feet away! And for nighttime snow removal, the iON two stage comes equipped with two integrated 0.3 W LED headlights that switch on to increase nighttime visibility. *Runtime may vary based on snow conditions.